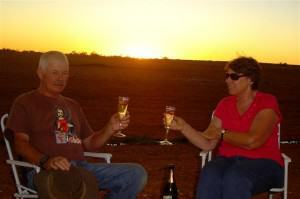 John has a list of places he absolutely has to see and number 4 on that list is the town of Noccundra in Outback Queensland. It’s a tiny little spot on the map that could be mistaken for a dirty mark on the paper. But he was determined that we were going there and, as he was doing the driving, I couldn’t argue. Well, I could but I’d just be wasting my breath. And so, we took the Diamantina Developmental Road from Charleville in Queensland’s southwest to Quilpie, passing through the village of Cooladdi on the way. The long straight stretches of road are amazing and the land is so flat you can see forever. 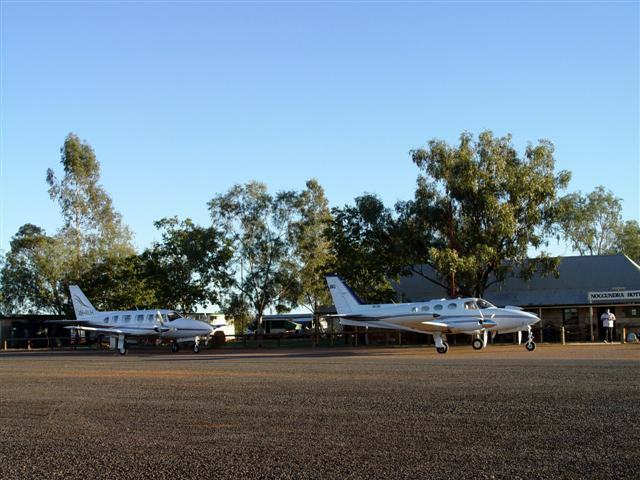 We stopped for fuel in Quilpie and then took our time with coffee on a well deserved break. The clouds were gone, the sky was clear, and the temperature was climbing. Quilpie is where the railway line ends and I guess once you get here you’ve really reached the end of the line! We were soon on our way again and it wasn’t long before we passed through the little town of Eromanga. We were a long way from the ocean at Eromanga! Eromanga’s only claim to fame is that it is further from the ocean than any other town in Australia. There is a monument to the opal miners in Opolopolis Park but we didn’t stop to see it. A pity because we were to learn later that the monument is, fittingly, inlaid with opal. Eromanga and the surrounding district are home to many of Queensland’s oil and gas fields and the town even has its own oil refinery. The oil and gas basin here produces about 1½ million barrels of oil each year. About halfway between Eromanga and Noccundra we stopped on the side of the road for lunch. A more lonely and desolate stretch of road you’ll never find. We hadn’t seen another car on the road for a couple of hours. It was eerily quiet, spooky almost, and I was anxious to get going. 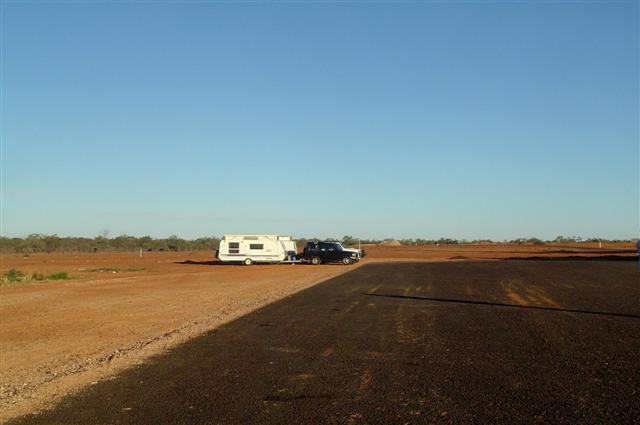 We finally arrived in Noccundra, population 4, around 2:00 and attempted to check into the Noccundra Hotel Caravan Park ([star][star][star_half]). I say ‘attempted’ because there are only 2 powered sites in this caravan park and they were already both occupied. But, as the man said, there’s 427,000 acres of unpowered sites to choose from and we could go and set up anywhere we liked. It was while setting up camp we were treated to the sight of a light aircraft taxiing up to the front of the pub. The passengers boarded and the plane taxied around to the runway at the back and took off. Where else in the world . . .
Over 400,000 acres of unpowered sites! They get lost out here! 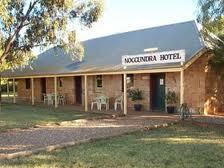 The historic Noccundra Hotel was built in 1882 and is all that remains of the town of Noccundra so if you’re planning on a big night out here your choices are definitely limited. The Noccundra Waterhole on the Wilson River is just opposite the hotel and a monument to the ill-fated Hume Expedition of 1874, when Andrew Hume led an expedition in search of survivors of the Leichhardt Expedition, is located in the hotel grounds. It sounds almost comical, doesn’t it? I wonder if they sent another expedition to find the two that were lost. After camp was set up John and I drove down to the waterhole. What a charming little spot. There’s lots of green grass and shade trees and the waterhole was full with the overflow from the river. There were a few campers there and the river looked beautiful but it is basic bush camping, at best, and definitely not for me. And so we returned to camp and our bottle of Two Tails Sparkling Wine and one of the most glorious sunsets we had ever seen. was all they had. Roast would do fine, I said. I was told that it was a combination of roast beef and roast pork but I strongly suspect that there may have been a little roo, emu, and/or dingo thrown in too. Whatever, it was delicious. And the wine list? The choice was red or white. Enough said. Of course, the place was full with guys from the oil fields who had flown in that afternoon, and parked their planes at the front door, and they’d been drinking pretty much since they arrived so they would have eaten anything! The only ones from that crowd who weren’t drinking were their pilots, as you’d expect, and they were happy to sit and chat with us. What a super brilliant night! Noccundra might not be 5-star, it’s not really even 1-star, but when the sun goes down it’s 500-billion-star! And I mean that literally! So magnificent and so very beautiful and it was still breathtakingly beautiful at 5:00 in the morning! If you’ve ever wondered what the night sky really looks like in the outback you have to come to Noccundra. I wonder if the have valet parking? didn’t want to miss the spectacle of the planes at the front door of the pub. I knew that no one would seriously believe us so I intended to get lots of photographs and we weren’t disappointed in any way. Two planes taxied around to the front, the passengers boarded and they were off. Absolutely amazing. The sheer novelty of seeing aircraft at the front door of the hotel was terrific but we were to learn that we were a bit of a novelty ourselves. We chose to set up our camp in an area where no-one has ever camped before and the locals were still shaking their heads over it when we left. Most people prefer to camp down by the river but I rather like the idea of being near amenities, even if I did have to cross the road to use the bathroom! Noccundra had not been my first choice for somewhere to visit; it was John who wanted to see the place. But when all was said and done I was actually sorry to leave. The people were immensely friendly and our van site, although unusual, was great. The only thing I was concerned about was if a road train had come through in the night but that didn’t happen and I strongly suspect that it was unlikely to; there’s nothing past Noccundra and the road ends a few kilometres further on. This is the place where you can really get away from it all and I thoroughly recommend it!